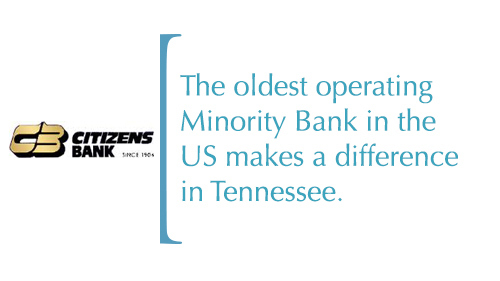 The oldest operating Minority Bank in the US makes a difference in Tennessee. Three distinguished leaders, Richard H. Boyd, James C. Napier and Preston Taylor opened the doors of Citizens Bank on January 16, 1904 as the One Cent Savings Bank & Trust Company. It was the first minority-owned bank in the state of Tennessee and it is the oldest operating Minority Bank in the United States. As indicated in the original charter, the intentions of the institution were “to encourage frugality and systematic savings among our people, to secure the safekeeping and proper investment of such savings, and to set in motion business enterprise. Today, Citizens Bank is a full-service bank offering the highest caliber of financial services to the community. The Bank’s mission is to be highly regarded and recognized for commitment, unique leadership, extraordinary customer relations, and a targeted array of services and programs administered by a highly talented team of dedicated financial professionals, leading the information culture for product delivery and convenience. Citizens Bank enhances its mission by being: a local financial nucleus expanding statewide; an integrated financial institution guiding the financial desires and philosophies of daily life; and a human-first bank realizing the economic dreams of all low-, moderate-, middle-income and minority groups.